Beth Janning, l., and her husband Paul, r., received the Nebraska Farm Bureau Young Farmer and Rancher Excellence Award. Nebraska Farm Bureau Photo. 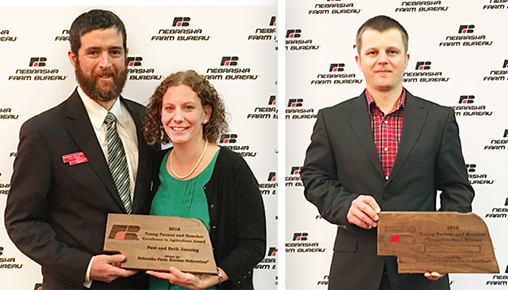 Paul and Elizabeth Janning of Hastings received the 2016 Young Farmers and Ranchers Excellence in Agriculture Award from Nebraska Farm Bureau. The award was presented during the membership recognition luncheon at the Nebraska Farm Bureau Federation’s 99th annual convention, Dec. 4-6, in Kearney. The Jannings, of Adams County Farm Bureau, were recognized for their ongoing involvement and commitment to agriculture. The award is designed to recognize young farmers and ranchers for their contributions and involvement in Farm Bureau and agriculture. Candidates for the award are judged on their involvement in agriculture, leadership ability and involvement and participation in Farm Bureau and other civic, service and community organizations. Elizabeth is the daughter of Keith and Maryann Maricle of Albion. She is now an Extension educator at Raising Nebraska, where she works to connect consumers to food and agriculture. Paul, originally from Kearney, is employed by DuPont Pioneer Seeds at Doniphan, where he is a maintenance mechanic. The Jannings have two daughters, three-year-old Maggie and one-year-old Mary. As the Nebraska winners, the Jannings will soon travel to the American Farm Bureau Federation Convention in Phoenix to compete for the National Young Farmers and Ranchers Excellence Award.